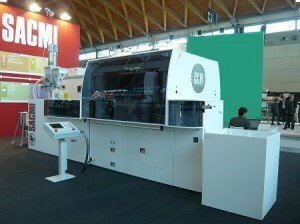 Sacmi presents the most competitive compression press for single-piece caps: able to produce up to 1,600 caps per minute with just 48 moulds, this technological gem produced by SACMI Imola’s Closures & Containers Division will be showcased in May at Chinaplas 2013. Designed and developed for the single-piece cap market, the CCM48 offers the most competitive solution for the manufacture of such caps for CSD, mineral water, hot filling and CAF (cold aseptic filling) products.Built by the Sacmi Imola Closures & Containers Division, the CCM48S can make 1,600 plastic caps per minute with just 48 moulds. The Sacmi team, world-leading producers of complete plastic cap manufacturing lines, will be displaying this technological gem – the pinnacle of a press series that is winning worldwide customer approval – on stands C41/C49 in HALL 4.1 at Chinaplas 2013, to be held in Guangzhou from 20th to 23rd May 2013. The CCM48 displayed at the fair will feature a mould for the production of S29W-3 HDPE (high density polyethylene) caps with a diameter of 29 mm, weighing just 1.25 grams. This is also an opportunity, then, for the Division to illustrate the more general competitive advantages that compression technology offers beverage plastic cap manufacturers: advantages that are enhanced when the machines in question are SACMI CCM (continuous compression moulding) units, all characterised by low consumption, short cycle times, low maintenance costs and outstanding flexibility of control, especially as regards the extremely short colour changeover times and excellent repeatability of production processes. Then, of course, there is the extreme practicality of using such compact machines and the possibility of integrating them with others such as the innovative CVS in-line quality control vision system, also produced by Sacmi, which has, in recent years, played a decisive role in developing cap production technology and leads the world in the creation of new solutions characterised by high productivity and low energy consumption. Solutions, then, that provide customers with the tools they need to take a more competitive market stance, especially in emerging nations like China where the fierceness of competition is matched only by the enormous potential of a continuously expanding market. Chinaplas 2013 is therefore a not-to-be-missed event for the Group. In addition to the innovative machine on display, the fair will also be attended by the Sacmi Closures&Containers, Sacmi Automation & Inspection Systems, Sacmi Hong Kong, Sacmi Nanhai, Sacmi Shanghai and Negri Bossi sales teams. Sacmi Automation & Inspection Systems will be presenting numerous inspection solutions, the most important being the new CHS cap quality control vision system, a state-of-the-art high speed machine that sorts and inspects caps. CHS series machines were developed for installation downstream from compression and injection production lines. They are particularly recommended for inspection after slitting and printing or before packing. Thanks to a modular structure that allows them to be set-up according to the customer’s specific quality control needs, CHS machines provide the perfect solution for complete cap inspection (inside and out). Chinaplas 2013 also offers an opportunity to present the new IPS220 preform injection press (officially launched in 2012) on the Chinese market too. Feedback following the first installations has proved to be extremely positive, with customers greatly appreciating its performance (productivity and energy consumption), flexibility and user-friendliness (fast format changeovers). While the machine itself will not be on the stand, our personnel will be available to provide visitors with comprehensive technical-sales information on this brand new product.